TORONTO, ONTARIO--(Marketwire - Oct. 21, 2010) - Vena Resources Inc. (the "Company" or "Vena Resources") (TSX:VEM)(LIMA:VEM)(FRANKFURT:V1R)(OTCBB:VNARF) announces that after an extensive geological review it has staked an additional 4,625 hectares near the Azulcocha zinc mine (see blue areas shown in map below). Jorge Paredes, PhD, a consulting geologist for Vena in Peru, performed an extensive regional review of the Cochas/Gran Bretana fault and surrounding areas. These new areas are 100% controlled by Vena and will be advanced geologically to define future drill targets. Juan Vegarra, Chairman and CEO of Vena stated: "Vena's core exploration group continues to build the pipeline of assets. Not only are we exploring jointly with some of the largest mining companies in the world, but we are very focused in sourcing early stage opportunities that can be advanced quickly and that have an optimal risk/reward profile. 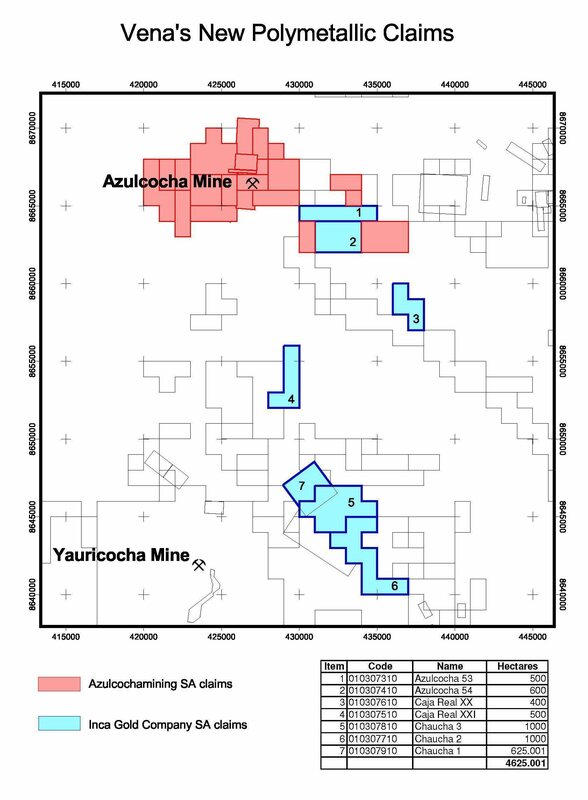 The Azulcocha mine is well on its way to becoming a producing asset and adding zinc assets will assist Vena with potential increases in mill capacity." In other news, the Company has finalized its agreement with Sienna Gold Inc. (Sienna) on the sale of 400 hectares of land that is adjacent to Sienna's IGOR project in northern Peru where Sienna will be conducting a drilling program in the near future. Vena received 355,000 common shares of Sienna (TSXV - SGP) representing the full purchase price for the 400 hectares. The common shares are subject to trading restrictions until December 25, 2010. Vena Resources Inc. is a Canadian mining company focused on the exploration and development of Peru's mineral potential. Employing a model of diversification across metals and regions in Peru to mitigate investment risk, the Company consists of four divisions: Mining, Clean Energy, Precious Metals and Base Metals. Together with the Company's strategic partners, Cameco, Gold Fields and Trafigura, Vena will advance its significant portfolio of almost 85,000 hectares this year. Through its board of directors and advisors, Vena Resources possesses a unique quality of skills and experience in management, mining and finance globally.